Boost Brain Power…at the Gym! Aerobic exercise is any physical activity that makes you sweat, causes you to breathe harder, and gets your heart beating faster than while at rest. Aerobic exercise uses your large muscle groups, is rhythmic in nature, and can be maintained continuously for at least 10 minutes. When performing aerobic exercise, your body requires more oxygen which gets pumped into the brain and allows it to work at its full potential. The extra flow of oxygen improves your memory, problem solving, and decision-making abilities. Along with the increase in oxygen intake, chemicals and hormones are also released during exercise that improves the functions of your brain. 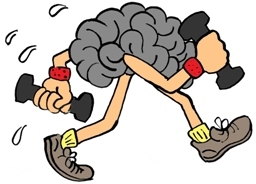 Many studies have been conducted to show the relation of aerobic exercise and brain function. One study by Charles Hillman, Ph.D, University of Illinois at Urbana-Champaign, gathered college-aged men and women who were to complete two scenarios. In the first scenario, the individuals took a mental test prior to the 30 minutes of exercise. In the second scenario, the individuals took a mental test after they completed the 30 minutes of exercise. The study showed that the exercise session enabled the subjects to process information faster and enhanced their concentration and ability to recall information! There are three variables to implement with the goal of improving your brain power via cardio: proper intensity, duration, and variety. The key is your level of intensity. Your goal level of intensity should be moderate-intensity cardio, which should produce a target heart rate that ranges between 50-70% of your maximum heart rate. You can calculate your target heart rate by subtracting your age from 220 and then multiplying by the % of your maximum heart rate (220 – age x %). You should be able to maintain this state of work for at least 10 minutes. Many of the studies conducted that showed improvement in brain function included at least 30 minutes of cardio three times per week. And lastly, it’s important to have a variety in your exercise regimen – experiment with a new cardio machine or try a new fitness class for a fun way to increase your heart rate and boost your brain power!